Home/Blogs/Autonomous Robots in India – How Bright Is the Future? Let me balance out the scene by providing a blunt definition of the real-life Autobots; so Wiki says, “An autonomous robot is a robot that performs behaviors or tasks with a high degree of autonomy”. Thus, any artificially intelligent machine that can mimic man is an autonomous robot. The whole foundation of Autonomous Robotics is based on three key concepts—perception, decision and actuation. A truly autonomous robot can perceive its environment, take a decision on its own and then actuate a movement based on its decision. Believe it or not, Roomba (the mobile vacuum cleaner by iRobot) is the simplest and one of the most perfect examples of autonomous robots. It is because a Roomba, when left alone in a room, perceives whether the floor is dirty using its dirt detectors; cleans up the dirt using its actuators; and decides to turn around and flee when it encounters an obstacle, like a chair. How Far Have the Robots Marched? Autonomous Robotics has conquered much more than just the confines of a room! Cimon (Crew Interactive Mobile Companion) is a head-shaped, floating robot that will be shortly heading for space as a work buddy of the astronauts! Besides a head, it also has a human voice that can respond to questions; a program that makes it think and draw a conclusion about a topic; and a personality of its own (ISTJ: Introversion, Sensing, Thinking, Judgment). Awesome, isn’t it? Ocean floors, on the other hand, are being ruled by the long-range autonomous underwater vehicles (LRAUVs) created by Monterey Bay Aquarium Research Institute (MBRI). These autonomous robots can move past upwelling shadows and wander as far as the nutrient-less zones! From studying phytoplankton to collecting samples at appropriate time and space scale, these bots can totally revolutionize underwater research. Getting the citizenship of a country is a long, boring and critical process. But not for Sophia! Created by Hanson Robotics, she is the first wonder bot to be granted the citizenship of a country. Yes, she is a citizen of Saudi Arabia! She was recently heard talking about gender equality, consciousness, ethics and many such critical topics at Brain Bar—the ‘biggest European festival of the future’. Aibo is full of charm and infectious energy; Aibo is also a robotic ‘dog’! It’s a mischievous little guy that keeps on running about the house, wagging its tail and exploring its environment. Aibo is a creation of Sony, and it is meant to be man’s next best friend—after dog. Autonomous Robotics is making rapid headway toward a new era. The whole world is going crazy over autonomous robots, and India is no exception. The Make-In-India campaign is indeed serving its purpose, and the future of Autonomous Robotics in India is not hazy at all. Let us meet India’s first 3D-printed humanoid robot, Manav. This tiny fellow (2 kg weight and 2 feet tall) can talk, dance and do push-ups just in response to human voice commands! Unlike other robots in India, it has 21 degrees of freedom distributed in its head, neck and waist, meaning that it can move its neck and waist more freely—like a human. It has been used for research purposes mostly. Daksh, the anti-terror expert created by DRDO (Defence Research and Development Organisation), is a made-in-India robot that will be joining the bomb detection and disposal squad of Pune Police Force shortly. Twenty of them are already being used by the Indian Army since 2011. This tough guy is a remotely operated vehicle (ROV) and can detect biological, chemical, radiological as well as nuclear hazards using its X-ray vision. Once it detects a hazard, Daksh navigates its way toward the hazard, moving past obstacles like stairways, steep slopes etc; tows the suspected object away from crowded places; and diffuses it with a jet of water. Not only these, other humanoid robots made in India, like Mitra, are already creating ripples in the global front. After its inauguration by Narendra Modi and Ivanka Trump, Mitra is now seen strolling the grounds of some PVRs and Canada banks, helping and greeting the visitors. IRA is another such robot which was created by HDFC Bank, in partnership with Asimov Robotics. It is seen answering FAQs and guiding customers across the bank. While Robocop, the police robot, secures and protects public places, airport robots like KEMPA and RADA liven international airports and assist the passengers to their flights. INDRO, on the other hand, was created inside a house with cheap material like aluminum, wood, cardboard, plastic etc. It is the tallest robot to be built in India. Thus, India is trying its best to keep up the good work. As I said, the future of Autonomous Robotics in India is not hazy at all. 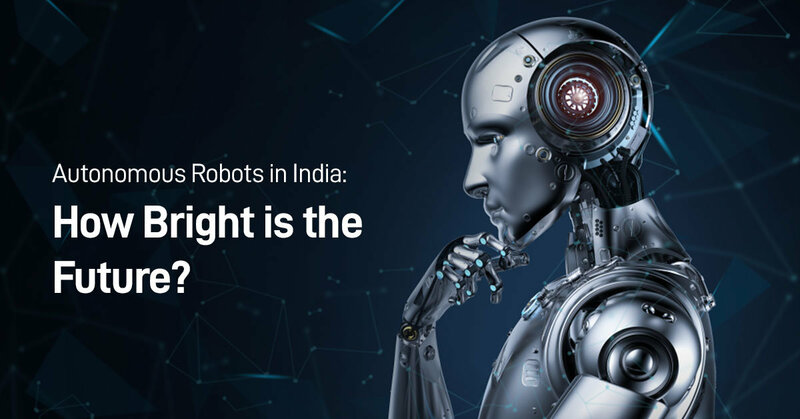 Although India has been categorized as a low robot density country in the world (only 3 robots per 10,000 employees), it is making progress in an exponential manner. However, it still has a great deal to accomplish to reach the standard set by the developed nations. If the Government and start-ups do not back out, the Make-in-India campaign will go a long way and the robotics industry in India will bloom. India may become self-sufficient in manufacturing hardware needed to construct robots, which will lead to a whopping rise in the robotic density across the country. Here is a sneak peek into the future of Autonomous Robotics in India. You heard it right! A team at A-SET Training & Research Institutes is working incessantly to build a smart, home-automated solution that can sense human feelings and perform tasks autonomously. So, tasks like opening doors to visitors; switching the television on/off or changing channels according to your mood; turning on/off the air conditioning according to an increase/decrease in your body temperature etc. will all be taken care of by your robot. All you need to do is to sit back and think! Another good news is for patients suffering from locked-in-syndrome. They will now be able to move about freely in a mind-controlled wheelchair, which is a mind–machine interfacing device that runs on thoughts (neural impulses). So, mind-controlled robotics is the next big thing that’s coming to India. Hi-Tech Robotics Systemz Ltd. has gifted us the first driverless shuttle in India—Novus-Drive. With a seating capacity of 14 people, Novus-Drive uses high-fidelity sensors and robust algorithms for path planning to navigate its own way. Incorporating such driverless means of transportation will mean no breaking of traffic rules; no accidents due to rash driving; no drink and drive incidents; and no hit and run cases. Not to mention, these shuttles are environment-friendly and noiseless! Curling up in a couch with a book, while robots do all the cleaning, cooking and dishwashing, is the perfect idea of a weekend, I suppose. With such rapid advancement of robotics around the corner, a future such as this cannot be too far off. Roomba has already been introduced before delving into the article; now let’s meet Arya–the first chai-making robot. All you need to say is, “Hi Arya! Make me my favorite cup of tea,” and your favorite chai is ready. From ginger tea to masala tea, all our cravings will be met and with perfection. If you are worried about the snacks and main course, Moley has already created the world’s first robotic kitchen, featuring a set of advanced, fully functional robotic arms integrated into a beautiful kitchen. This kitchen is yet to make its headway to India though. Apparently, the future will be free from tantrums thrown by Maids! Dr Girdhar J. Gyani says, “5.2 million medical errors are happening in India annually”—a dreadful fact indeed! On top of that, the number of specialists in the country is worrisome: although 50,000 MBBS graduates pass every year, only 18,000 postgraduate seats are available. Incorporating robots as medical assistants and surgeons can go a long way in the medical field. The rate of medical errors will drastically come down (as robots are known for their accuracy), while the number of specialists—even in rural areas—will shoot up. Though it’s a distant dream, Indian masterminds like T Jayakrishnan (founder of ASIMOV) are already at work—he is trying to bring onboard the Cranio Bot (a bot meant to assist in surgeries to correct craniosynostosis). From Arya, the robot chai maker, to Arya, the robot soccer player, the world of autonomous robots will be either empowering or outpowering the world of men. Hence, the right approach to the future is developing an open mind and keeping ourselves updated. Speaking of Autonomous Robotics in India, although the future is very promising, it still has a long road ahead and the path is indeed bumpy. Lack of capital investment and skilled workforce can bring down India’s progress. The Government needs to keep an eye on these issues. Moreover, it needs to provide proper platforms for students aspiring a career in robotics, and more colleges and universities need to be established. iNurture, which provides a multitude of UG and PG programs in Robotics in collaboration with various universities, can provide a vast number of opportunities. It provides well-curated, technology-enabled programs that can make us ready for the future.